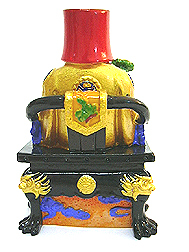 This large size smiling golden tua peh kong is colorfully painted with fine details. 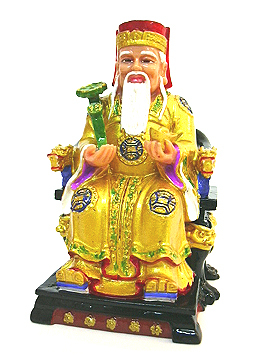 The Tua Peh Kong is another wealth deity who is very popular among tycoons and businessmen in Asia. He is one of the Five Wealth Gods, in which the other four is in heaven but he is more special because he takes care of distributing money on earth. He is famous for helping people at striking lotteries in Singapore and other parts of southeast Asia and therefore is known as God of Windfall. 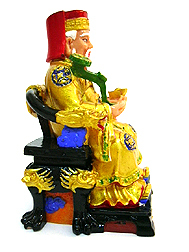 He is depicted sitting on his dragon chair and carrying a big gold ingot (to multiply wealth) and a Ru Yi (to enhance authority and power). This statue is most suitable for workdesks, large wealth vases, receptions and cashiers. 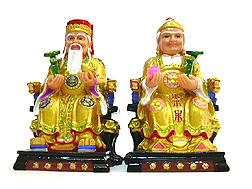 To maximize the luck for the whole household, where both the man and women of the family also benefit from windfall, one should get both the Tua Peh Kong and Choy San Poh. They can be either paired up together to work wonders for you or individually placed in SW (benefitting the matriarch) and NW (benefitting the patriarch).